Tender lamb's liver is coated in a glossy balsamic glaze with caramelised onions, and served with a generous helping of herb mash. Peel the potatoes then cut into small chunks and cook in boiling water for 10-15 minutes or until tender. Meanwhile, heat the oil in a large, heavy-based frying pan, preferably non-stick. Add the onion and sugar and fry gently for 10-15 minutes, stirring frequently until the onions are golden. Remove any veins from the liver slices. Pat the meat dry with kitchen paper, and lightly season. Push the fried onions to one side of the pan, add the liver slices and fry gently for 1-2 minutes on each side until lightly browned. Add 100ml cold water and the balsamic glaze to the pan, then stir until the liver and onions are coated in glossy juices. Remove from the heat. Drain the potatoes and return to the pan. Add the milk and plenty of black pepper, then mash until smooth. Stir the parsley and sage through. Pile onto serving plates with the liver, onions and pan juices, and serve with lightly steamed purple sprouting broccoli and courgettes. 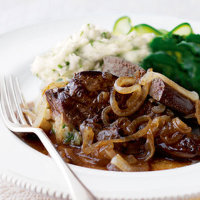 Try a rich, fruity Australian shiraz which has a smooth chocolate and oaky finish and is a good match with lamb’s liver. This recipe was first published in February 2008.